SGK Media delivers custom website design solutions. Other web design companies might offer mass-produced or template based designs, whereas we focus on making something that is catchy and new. 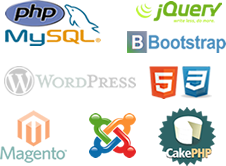 We first capture your website design requirements and proceed only after we completely understand your needs. Our passion drives us. We love working with clients who expect high quality web and logo identity, from the look and feel of the site, to the color palette that will be used across web and print mediums. At SGK Media, we have assembled a world-class team of web designers that relentlessly deliver perfection and quality. Our dynamic team has over 15 years of experience, combined, in web design and identity development. Businesses from around the globe have chosen to start or revitalize their online presence with us. We hope you do the same! Contact us any time to see how we can be of service.